These sour cream cookies are a long time family favorite recipe. They are soft, flavorful and perfect as drop cookies or cut outs. My Aunt Marlene would never claim to be a cook. In fact, she often claims just the opposite. However, I have never once been to her house and had there be a lack of yummy treats. So really she just sells herself short! I remember her making these for us when we were kids. We had never had sour cream cookies before and we loved them! She usually made them as drop cookies. She would cover them in a yummy icing (cream cheese if I remember correctly) and they were yummy balls of deliciousness! Marlene got this recipe from her brother-in-law Mark's mom and nobody who has tried them hasn't liked them. When I asked her for the recipe, she did one better. She brought a batch with her when she came to visit. This batch was rolled, cut and decorated and super cute! They are softer than a regular sugar cookie and I find them a little harder to roll, but they take well to shapes. Jax needed something to bring for Valentine's Day at daycare. He also needed a treat to bring his betrothed! So, I thought this would be a perfect time to make these cookies. 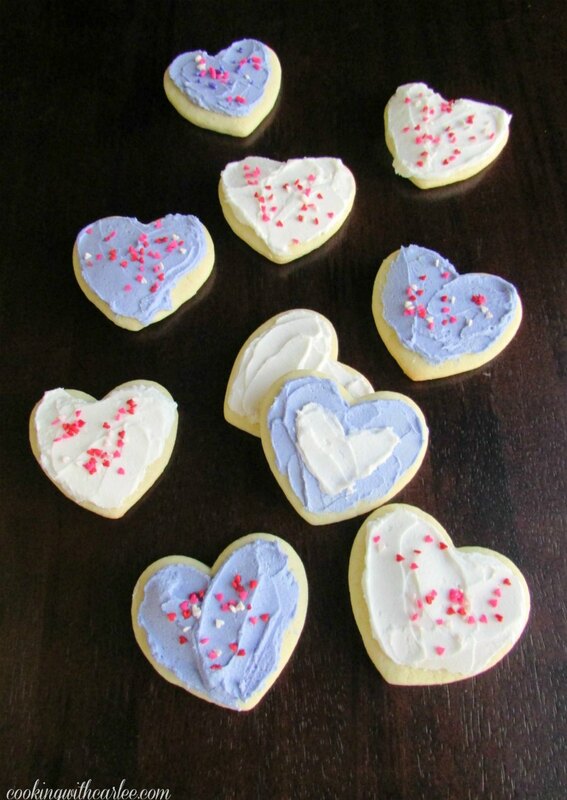 Decorated Sour Cream Cookies and Chocolate Sour Cream Cookies for Jax's Valentines when he was just a little tike. Last year we made Peanut Butter Blossoms with heart chocolates and they were perfect. This year he wanted sprinkle cookies. So, we went back to the original valentines cookies and made these beauties. A couple of years ago I frosted them with Royal Icing. This year we went with Crusting Buttercream and of course plenty of sprinkles! These cookies are a long time family favorite recipe. They are soft, flavorful and perfect as drop cookies or cut outs. Cream together sugar and butter. Mix in eggs, sour cream and vanilla. In a bowl, mix flour, salt, baking powder and baking soda. Add dry mixture to wet mixture and stir until just incorporated. The dough will be soft. Wrap in plastic wrap and chill for at least 2 hours. Roll out on a well floured surface and cut into desired shapes. Bake at 350 F for 5-10 minutes depending on size of cookies. You want them to be set, but light in color when they are done. Jaxon's Valentines are sure to be a hit! There will be lots of cute little faces and hands that will need to be washed after this yummy treat. Hopefully the kids like them! Thanks Karen, they were a lot of fun! The daycare party is today, so I hope the kids like them! Your Sour Cream Cookies look wonderful! Hope you had a great Valentine weekend and thanks so much for sharing your awesome post with Full Plate Thursday. Thank you, they were a lot of fun to make. I hope you had a great weekend as well! Thanks, Andrea! I hope you had a great Valentines Day! Thank you so much! They were a hit with my little guy anyway and that is what matters! Oh Carlee, I laughed when I caught the "betrothed!" 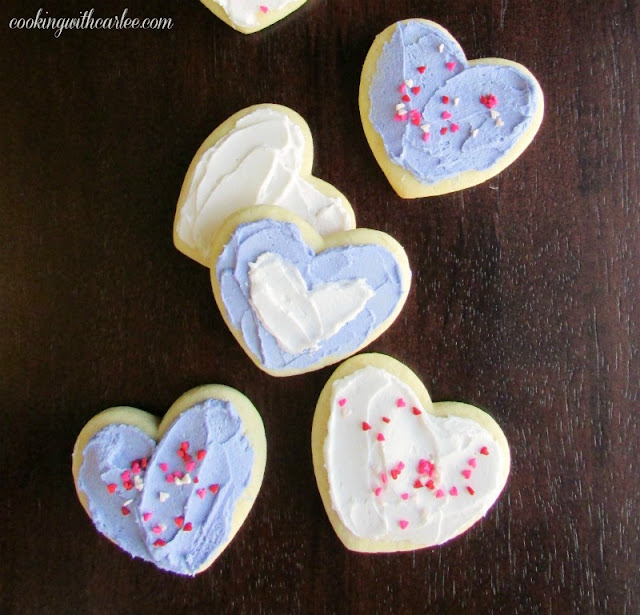 The cookies look wonderful, but I admit to liking the hearts best! I do love sour cream sugar cookies, they're never dry!! Hehe! He gave our friends' daughter a ring when she was just a few weeks old. Of course he was only 1... so who knows if it will stand the test of time. But right now she is his best friend and I keep telling her parents to work on the dowry! ;-) He gave her and her mom cookies today, so he is staying in her good graces! These would be good no matter the shape! Pinning for Easter. Thanks for sharing. They would be perfect for Easter! Thanks, Linda! These sound absolutely delicious! I am totally making them this weekend! These sound so good! 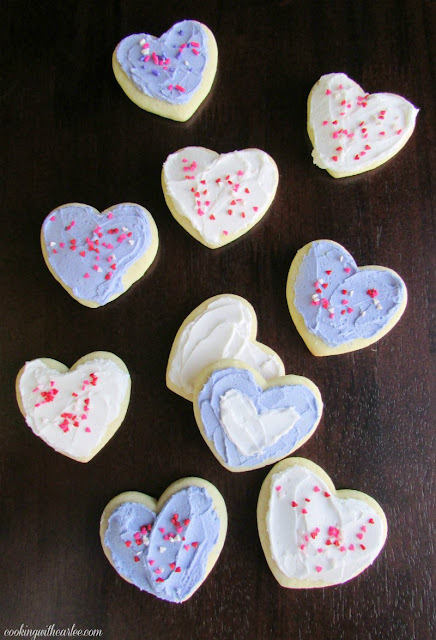 I've been craving some sugar cookies like this. Thank you, I hope you love them! I HAVE a recipe for sour cream cookies that are great fresh, but dry out so quickly. Your recipe looks richer, believe I'll give it a try. Thanks. I hope you love these ones as much as we do! They really do! She is definitely a keeper! Those look adorable and I'm quite sure they are delicious as well! Thank you, Kimm! They are definitely a family favorite! Hi Carlee, the cookies look delicious and any young lady who received them from Jax is a very lucky young lady indeed. To be honest they almost look to pretty to eat... I did say almost! She is pretty lucky. He is good in the kitchen and his daddy as taught him a lot about tools as well. He's going to be quite the catch! I'm sure he would have loved sharing these with you too, if only you were closer. He enjoyed passing them out! Sour Cream Cookies are the best! I could go for a couple right now! Oh you had me at sour cream!!! Yummy, I used to get a sour cream donut at the local shop. How can you not love sour cream, right?! Thanks for sharing with us at Family Joy Blog linky party. We go through a lot of sour cream here. My husband LOVES it on just about anything and I love to baked with it. Now you have me hungry for a sour cream donut though... yummmm! Carlee, these look absolutely delicious, I love a buttercream frosted cookie. But they are adorable too. I'm sure that Jax's betrothed was delighted with her gift. LOL he's starting early isn't he? I bet the girls will be flocking to him for not only his good looks, but his baking skills! He is definitely going to be a catch. He knows how to cook, but also knows his way around the workshop. If you misidentify a tractor, you are sure to hear about it too! He is quite the well rounded three year old. And his betrothed and her mommy liked the cookies, so he is in pretty good shape! Thanks so much for sharing these delicious cookies with us at Full Plate Thursday! Hope you have a great week and come back to see us real soon! I bet those are moist little gems! So glad you linked them up on the cookie exchange at celebrate365 blog party! They really are. Thanks, Jan!